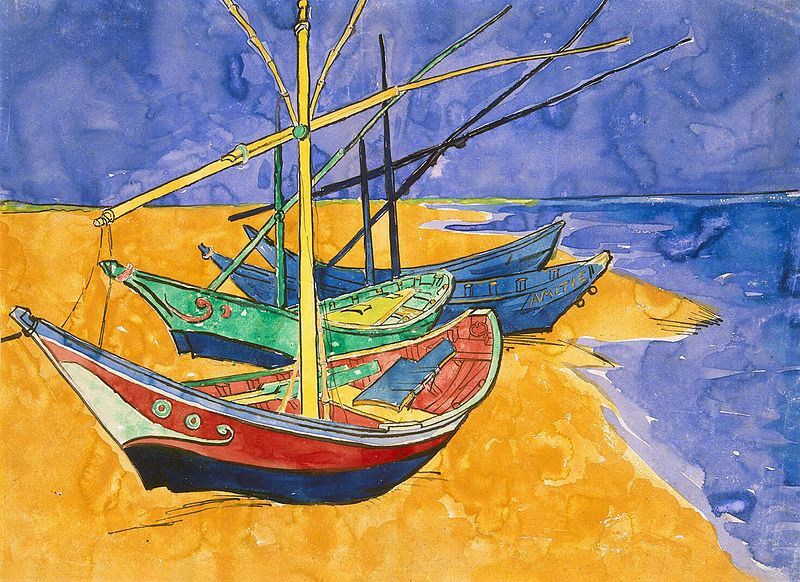 Over the past few days, Vincent van Gogh’s “Fishing Boats on the Beach at Saintes-Maries” has been a constant companion in my studio/work space. While I work at my computer, I find my eyes betray me, enticed by the vibrant colours of gold, red, green and blue. I am lost in the chemistry of the vivid scene that speaks of a faraway place of sun, sand and deepest blue sea. I live on the Pacific Ocean, miles away from the sea-side fishing village of Saintes-Maries-de-la-Mar situated on the ancient Mediterranean Sea. Yet, when I focus on the painting, I am transported back in time to 1888. I feel the gentle warmth of a breeze from the water, carrying the scent of seaweed, fish and sea salt. I am there with Vincent. It is early morning, before the boats head out to sea. Timing is critical for fishermen rush to begin their workday. I feel Vincent’s profound desire to capture the emotional and visual impact with pen and paper. Loud voices, laughter, and activity energize the beach. I look over Vincent’s shoulder as his pen touched paper. With every mark made, the drawing came alive with the formation of the sea, sand and three boats. It is a defining moment; now I see the beach through Vincent’s eyes. The beach is devoid of humanity. Only the sound of sea and wind remain. There is a quiet solitude. Vincent Van Gogh to his brother Theo. In the midst of life’s hustle and bustle, there are moments of respite. In the midst of noise and confusion, we can envision tranquility. Just found this Rebecca, and can’t imagine how I missed it…. glorious colours, and interestingly it reminded me of the painted boats pulled up on the tropical sands a mile or so from our house at a tiny place called Pengalen Chepa in northern Malaya – back in 1955 !!!!! A beautiful post, Rebecca and I love your use of his letters to his dear brother with such effect. I’ve read a book of a collection of his letters and they are wonderful and heartfelt…giving such an insight to the artist. I’m glad this painting has been by your work place, giving inspiration, peace…I’ve been a couple of times to the Van Gogh museum in Amsterdam and never fail to be overawed by his work; as you write the colours are incredibly vibrant, so full of life and vitality-also the sheer size of some of the paintings was astonishing and unexpected! Thank you, Annika for your heartwarming comments. Of all of the artists, I feel a close affinity to Vincent Van Gogh. I think many people feel the same way. Perhaps this is because we have a more intimate understanding via the letters between brothers. There is a deep and abiding love that runs through their conversations. I can only imagine how wonderful it was to visit the Van Gogh museum in Amsterdam. I do love my art calendar for it focuses my attention on creativity and prepares me to embrace the beauty and joy of the day. It is so easy to get involved in the busyness of life and focus on the “urgent” rather than the “important.” Opening a “new” day with a “new” painting is a Zen moment for me. Have a wonderful day. Thank you for connecting. Oh, yes! It is a book. In fact, I was on a mini-research project about diarists and came across this quote by Pablo Picasso: “Painting is just another way of keeping a diary.” I came away thinking, we all document our story, whether in poetry, writing, singing, dancing, photography. Your thoughts are very much appreciated! Hugs. The wonderful thing about Van Gogh is of course that he shared all his thoughts with his brother Theo in his letters. Thanks to that we know what motivated him, and that he got up early and many more details. There is a version of this painting in Amsterdam, and every time I visit the Van Gogh museum, I count myself lucky that these masterpieces are at a walking distance from my house and are like old friends whenever I see them. On Friday nights the museum often organises music and workshops. In one of those workshops I painted a ‘Starry Night’ after having a glass of absynthe, as you probably know, Vincent liked to drink absynthe. Thanks, Rebecca! You are so very lucky!! And yes, I know exactly what you mean when you say “old friends.” There is a familiar connection. It is as if the artist is reaching out over time and space to continue the discussion, to give hope to another generation. To remind us to live NOW, to use our talents, to leave a mark behind to inspire those who come after. I like Pablo Picasso’s thought “Painting is just another way of keeping a diary.” Thank you for your comments – I do love our conversations. Hugs! It’s so important to find moments of tranquility during the day, and, as you so rightly point out, art can help us do that. An ophthalmologist once told me that a wonderful cure for tired eyes was to look at the ocean’s horizon as there are no vertical lines and the eyes can rest on the horizontal line. Enjoy the view, my friend. I have often wondered whether we thrive on the drama of busyness. There is a feeling of adrenaline that boosts our feeling of “being alive.” When we step back into nature it seems that we return to our “default position” of being immersed within a eco-system that encourages us to reflect and embrace an inner journey. Interesting thought from your ophthalmologist. I agree wholeheartedly. I recently posted a photo of the ocean where the sky and earth merged into one. The response was overwhelming. Thank you so much for sharing this moment with me – very much appreciated. This was my first introduction, as well, thanks to my art calendar. Incidentally, my 2018 Art Calendar is ready for pick-up at our local post office. I confess that I must exercise great restraint for I want to open it up for a preview. I usually have to hide the calendar somewhere in our home to avoid temptation. One year, it was so hidden that it took me to the middle of January to find it. But I digress… This is a watercolour that is located in the Hermitage Museum. I was surprised by the strong colours. I usually associate watercolours with a softer pallet. Hugs coming across the pond to my home away from home! Ich freue mich, dass Sie die Post genossen haben. Ich mag die Geschichten hinter dem kreativen Streben erforschen, denn das ist, was den Gemälden Leben gibt. Es ist leicht, sich mit dem Künstler zu identifizieren. Eine Geschichte verbindet uns über Zeit, Raum und Sprache. Vielen Dank, lieber Freund für Ihren Besuch und Kommentare. Vincent Van Gogh–what a genius! and it is refreshing to me that he sent this to his brother. Thank you for sharing, it makes Vincent more human, somehow. This reminds me of the times that we pass the many sail boats in their harbor. Their owners much enjoy many hours of pleasure and rest on the water. Would you believe that I read that quote to friends a few days ago? I’m not surprised to see it again, and what a lovely pairing with those beautiful blues and yellows/golds in Van Gogh’s stunning painting. Thank you for a tonic for the eyes and soul while my soul sends whispers of concern for those affected by H-Harvey…. We may be on opposite sides of the world, my dear friend, but we are traveling the same path. When colours come together there is a synergistic joy that speaks to our souls. It is an affirmation that diversity sustains our lives in ways we cannot event imagine. My heart goes out to those people affected by Hurricane Harvey. They continue to be in my thoughts and prayers. Thank you, dear Aquileana. I continue to be amazed by enormous influence art has on our emotional states. I see the sunflowers too. And now I know why. I just researched the sunflowers and found that Vincent began painting sunflowers when he came to France. The first sunflower paintings were created to decorate his friend Paul Gauguin’s bedroom. Can you imagine how wonderful that would be!! Thank you for your marvelous blog about mythology that connects artistic endeavour with humanity’s need to search for meaning. Hugs coming your way. An interesting post, Rebecca. Aptly timed since it’s only few days ago I once again saw Vincente Minnelli’s ‘Lust for Life’ about Van Gogh. Thank you, Cindy. Have you been to Saintes-Maries in your travels? It is still a relatively small town with a population of about 2,500. The name came from the narrative that told of the arrival of Mary of Clopas, Mary Salome and Mary Magdalene – three women named Mary. I do love all the stories hidden in the folds of history. Thanks for stopping by – very much appreciated!